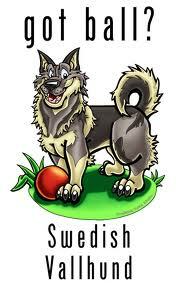 The Swedish Vallhund is an ancient breed known by the name Vastgotaspets﻿﻿ in it's homeland of Sweden. In Canada, this breed was listed in the miscellaneous group until Ulla Gamberg of Vastgota Kennel began the tedious work to have the Vallhund recognized by the Canadian Kennel Club. This would allow the participation in the conformation and obedience rings. With a very limited number of dogs in this country the breed began to take hold, and in 1995 the Vallhund was officially a recognized breed. Our national club is for membership to promote responsible breeding and ownership of the purebred Swedish Vallhund. Together we try to encourage participation in conformation, obedience, herding, tracking, agility and other activities which demonstrate the qualities of this breed. Following the Official Swedish Vallhund Club of Sweden [ Special klubben For Vastgotaspets, SKV], the Swedish Vallhund Club of Canada and in conjunction with other official Swedish Vallhund organzations internationally, want to make it clear that we do NOT support or endorse the so called 'list' displayed on various websites [some anonymously owned], or circulating via email, regarding unorthodox research on the Swedish Vallhund Breed.